In the past few days we saw a little know ‘meme-coin’ called ‘DogeCoin spike up as much as 200%. Dogecoin was famous in the crypto boom of 2017 for being a perfect example of how easy it was to produce a cryptocurrency with a half a billion dollar market cap without any significant underlying value proposition. Dogecoins recent price hike was apparently due to breaking news about a project called the ‘Dogeetherum bridge’. Now, the Dogeetherum bridge has been promoted by the media as a way to connect both Dogecoin and Ethereum to allow Dogecoin to have some of Ethereum’s features, including the ability to host smart contracts. However, the reality is very different and unfortunately far less impressive. In April, a planned fork of Ethereum (Dogeetherum) was initiated with a new coin called ‘DOGX’. This fork would grant DOGX tokens to users based on their DOGE holdings on the DOGE main chain. Apparently, this project never came to fruition. In fact, the source code was never released and it likely the case that it was just a scam to steal DOGE private keys. These details have been surprisingly omitted (intentionally or out of lack of knowledge) from various media sites reporting on the Dogetherum story. By promoting it as a true bridge between Dogecoin and Ethereum, and as an innovation capable of offering variety of Ethereums features (including smart contracts), the price was clearly bound to skyrocket as many people would perceive this as an incredibly valuable offering for Dogecoin. 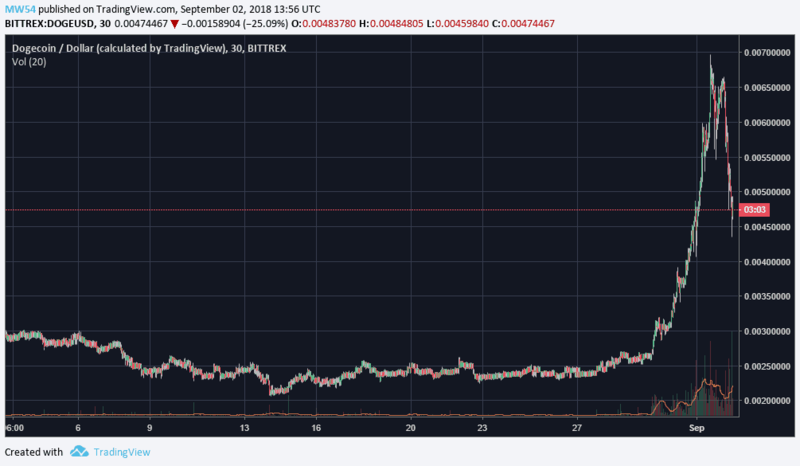 Everyone has now been purchasing DOGE thinking that when Dogethereum launches in September they will receive DOGX tokens in exchange for their DOGE or that Dogecoin could somehow become the next Ethereum. This type of misinformation is very dangerous for the crypto space, as the vast majority of participants are retail investors who don’t normally take the time to conduct the high level research that institutional investors do. As journalists, we must be responsible for providing a layer of protection to retail investors in the form of accurate information based on facts and not pure speculation. The sharp rise was entirely base on hype and FOMO (fear of missing out), followed by a sharp decline that was likely caused by investors quickly realizing the truth of the story, or simply cashing out of what they knew would be an unsustainable price hike. Dogecoin may likely have some value amongst its community of developers and users, and its development of a bridge to other blockchain will likely prove useful in the future. However, as is usually the case, the hype created around new development stories (factual or not) usually exceeds what is actually being delivered, leading to massive price surges that subsequently end in equally massive sell offs only to achieve short terms gains that ultimately undermine the long term prospects of these crypto projects.